Car Bomber Kills 44 Police Troops In Indian-Controlled Kashmir "The blast was so powerful that one cannot recognize whether the [police] vehicle was a bus or a truck. Just pieces of mangled steel," a police force spokesman said of the attack on Thursday. 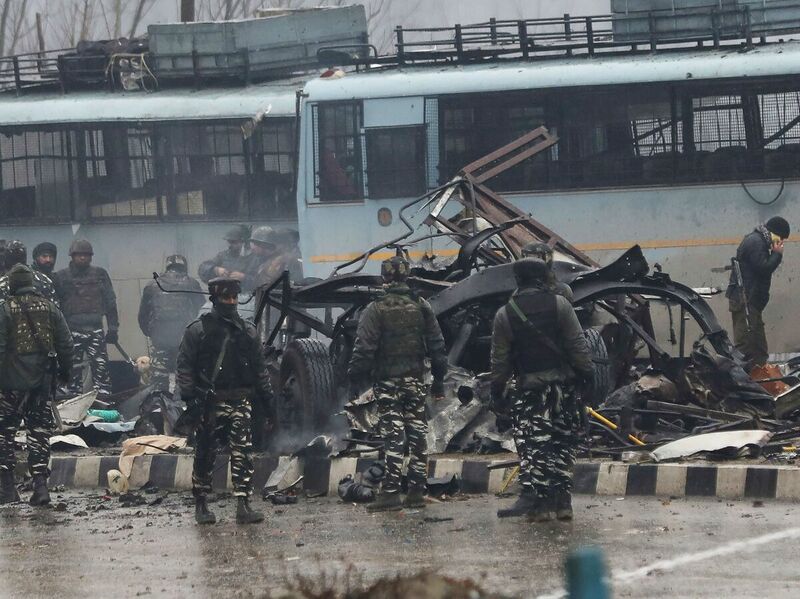 A convoy of buses carrying Indian policemen in Kashmir became a disfigured wreck of steel and bloodied body parts after a bomber rammed a car full of explosives into one of the vehicles on Thursday, killing at least 44 officers and injuring nearly 20 others, according to the latest count from Reuters and local newspapers. It is one of the deadliest attacks on security forces in the disputed state over the last three decades. Officials said a local Kashmiri militant — a relatively new member of the Islamist group Jaish-e-Muhammad – who was driving a van full of explosives, targeted the caravan at about 3:15 p.m., just as the buses made their way into the outskirts of Srinagar, the Associated Press reported. "The blast was so powerful that one cannot recognize whether the [police] vehicle was a bus or a truck. Just pieces of mangled steel remain of the vehicle," Sanjay Sharma, a spokesman for India's Central Reserve Police Force told the news service. A police force official who spoke with the newspaper Greater Kashmir, said the convoy included approximately 2,500 personnel traveling aboard 78 vehicles when they were ambushed. It was an unusually high number of officers on the road at the time, after bad weather conditions and administrative decisions had kept the force from making the trip from Jammu to Srinagar for several days. Shortly after the blast Jaish-e-Muhammad claimed responsibility for the attack, the newspaper reported. The incident is likely to raise tensions with neighboring Pakistan, as the two nuclear-armed nations continue to battle over sovereignty of the divided Muslim-majority Kashmir region. Anti-Indian rebels have been fighting for an independent Kashmir, or a merger with Pakistan, for three decades. Prime Minister Narendra Modi called the attacks "despicable" in statement on Twitter. "I strongly condemn this dastardly attack. The sacrifices of our brave security personnel shall not go in vain. The entire nation stands shoulder to shoulder with the families of the brave martyrs. May the injured recover quickly," Modi wrote. The fatal attack has forced Modi, who faces a general election in May, into the center of what could become a dangerous crisis, Moeed Yusuf, associate vice president of the Asia Center at the United States Institute of Peace told NPR. "Modi, who is very jingoistic, is going to use this to the hilt to rally his supporters against Pakistan," Yusuf said, explaining that it puts the prime minister at risk of antagonizing Pakistan "and that may have lasting consequences." "If the Indian government flexes its muscles diplomatically or militarily, which it has done in the past, I don't think Islamabad will take it quietly," he added. Yusuf noted that the key factor in preventing war between India and Pakistan has been U.S. mediation and diplomacy efforts that have served to cool tensions. Ken Juster, the U.S. ambassador to India, condemned Thursday's attack. "We send our heartfelt condolences to the families of the victims. The United States stands alongside India in confronting terror and defeating it," Juster said on Twitter.